I haven’t read a true crime story in a long time, and I was really looking forward to it. I was mildly disappointed, then, to learn that Woman Into Wolf “combines the events of several real cases, but other than Digger, who was a real dog, and the Bird Lady, who was a real person, characters must be considered inventions of the author.” It’s not true crime, I don’t think, if it’s been made up, even if the events purportedly did happen. Nevertheless, I put my reservations aside and sat down to chapter one: “The Animal Bridegroom.” Well, this could get interesting, I thought. And interesting it certainly was. Lucky for me, both Digger and the Bird Lady have prominent roles in this fictional “true crime” novel. Persephone, Persey for short, is a housewife who suffers though a detective’s complaints about a murderer whose victims have never been found because his bosses won’t listen to him and go out looking. The next morning, she hikes off the trail a ways with her dog, Digger, into virtual no man’s land and finds not one, but two bodies. One is a skeleton that has probably been around for a long time; the other is “fresh” and still in the process of decaying. She calls the detective and a whirlwind begins. The characters seem stock at first, but at least Persey grows into her own, and that’s a relief. I was hoping I wouldn’t have to put this book down as another bodice ripper or “all women are victims” type story, and thankfully, it isn’t (though it threatens to stray into that territory more than once). Persey deals with her husband, Roy, and his mother, Babe, who wants her to have a baby so badly that she is always on the lookout for a “baby-bump.” And though Persey may start out as “just a desperate housewife,” after she takes initiative and searches for the cadavers she finds on her hike that morning, it’s clear that she’s anything but weak or in need of protecting. It’s nice to have strong women characters every once in a while. I was pleasantly surprised by the caliber of writing in Woman Into Wolf, and would recommend it as beach reading for those who have a thing for true crime. 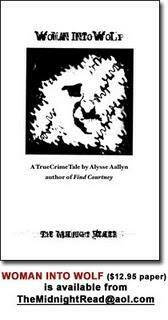 While it still rankles a little that it’s not actually a "true" true crime story, Alysse Aallyn does a great job at braiding the plot together in its various forms to reach a relatively satisfying conclusion. It’s not Shakespeare, but it’s still pretty good for “guilty pleasure” read.